So, in an attempt to start off this blog, here we have the Milka Raspberry Cream, which I discovered in a local Polish shop. It's a while since I ate this bar, but as I recall it was very, VERY sweet. I presume it's intended to be a Polish-only edition as there is no English on the back of the wrapper (but there is on the front, strangely). I can't help but wonder if this bar had a different recipe to regular Milka bars, because the sweetness totally overpowered any taste of chocolate. The raspberry sauce was very artificial tasting; the kind of flavor those cheap kiddies juice drinks used to have. And the "cream" pretty much just tasted of sugar. A brand new blog- good luck Kev! I think they do a Strawberry Yoghurt flavour too, so perhaps that might be a better bet. I've tried the Strawberry Yoghurt version, which was MUCH nicer I have to say. I hear there's also an elderberry cream version in white chocolate, which sounds intriguing if not sickly! 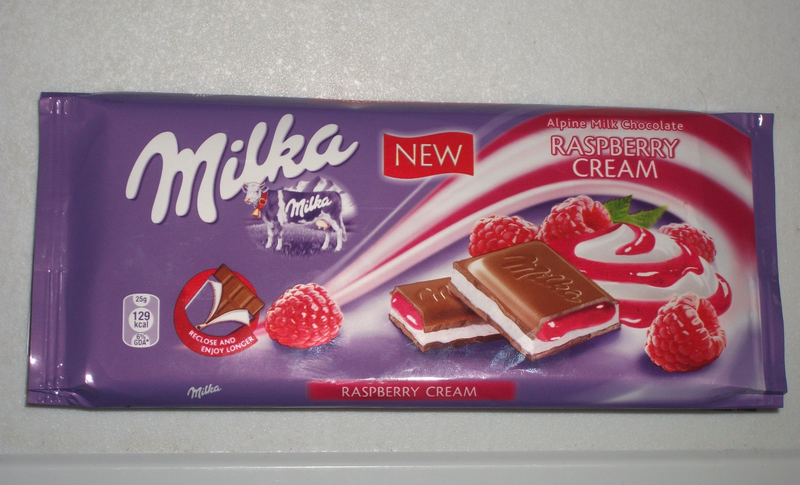 I am a big fan of Milka but I think I would give this one a miss too if the raspberry is a bit cheap tasting. I love raspberries but I hate it when they are made to taste too sweet or artificial! Yes, raspberry seems to be one of those flavours that often ends up tasting cheap, unfortunately. I had a box of Black Magic recently and the raspberry parfait in it was horrible! It's actually available pretty much everywhere in Eastern Europe. You may be right about the different recipe. I don't know what Milka bars you get in the UK and I cannot say I'm 100% sure about this, but I also have the impression that our Milka bars are sweeter than the German Milka imports some stores occasionally get. For me, the raspberry sauce was the only part I liked about this bar, even though it was thinner and did feel more artificial than the limited edition bars they launched this summer. Those actually had something that was more like a jam with tiny pieces of fruit, but there was less of it vs more sweet milk cream and I didn't like that. Glad I'm not the only one who thinks the recipe is different! The Milka bars we get in the UK seem much creamier and richer in taste, so I suppose we are lucky to get the German imports. This is my favourite Milka!! And a chocolate is supposed to be sweet ^^ The best ever.